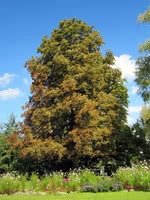 Manchurian Walnut is a large, broad and often multi-stemmed tree with ornamental qualities. This tree produces large, thick-shelled nuts that ripen in the fall. These edible walnuts are reportedly difficult to crack open. They are useful for attracting wildlife, especially squirrels. The Manchurian Walnut contains and exudes much lesser quantities of allelopathic compounds, such as juglone (common to walnuts), that may prevent or impair growth of nearby plants. Therefore, it is commonly embraced as a safe walnut to plant. There are reports of rare this species surviving winters to -45C with specimens growing and thriving in Alaska and Edmonton. There is no regular supply of this species. It is rare and not produced each year.